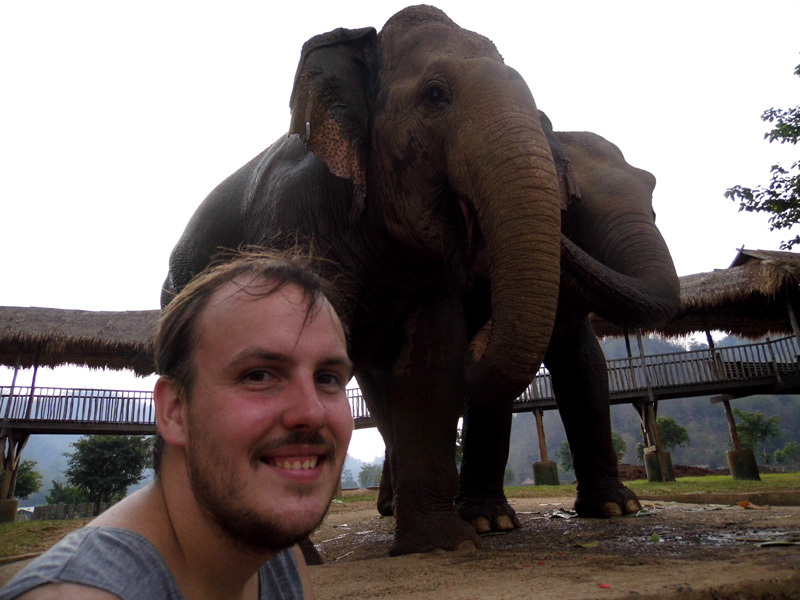 A few years ago, a friend of mine spent a week at a great organisation in northern Thailand called Elephant Nature Park, and for the following weeks and months, she continued to shout her praises for the founder and has been back a couple of times since. I knew straight away that I’d love to spend some time there. Then Amanda from A Dangerous Business visited last year and had a lot to say about it, which made me even more keen to go. So in December, I was hugely excited to finally put down our deposit and book in for the middle of April!! Our entire Thailand schedule was based around Songkran and our week here. The beautiful Mae Jaan Peng (aka Full Moon). She was my favourite elephant at the park even though she found it hard to make friends. She has a hole in her ear from hooks, and ENP has put a flower in its place. Elephant Nature Park was set up by the inspirational Lek Chailert, who has dedicated her life to rescuing elephants from the tourism and logging industries. Even though elephant logging is now illegal, there are many practices particularly around the Burmese border, where elephants are injured by mines, forced breeding programs, and the work itself. 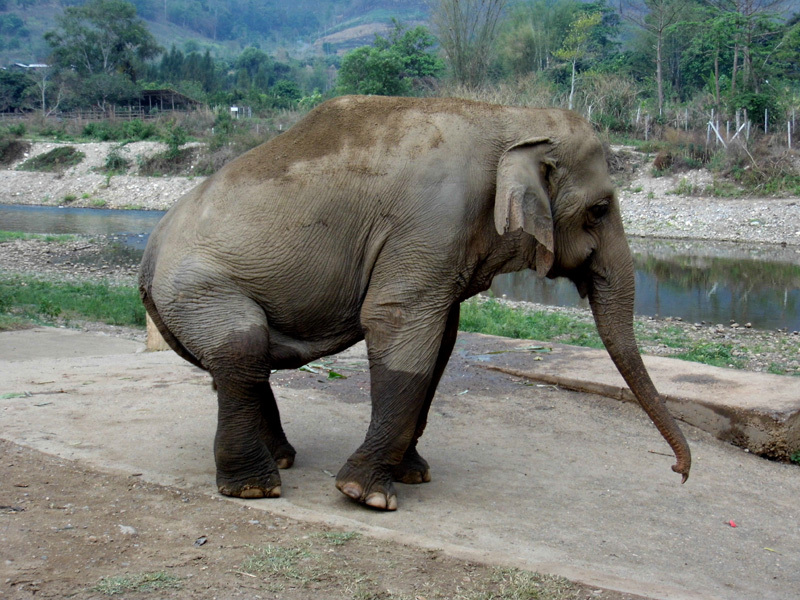 Medo: This poor girl endured lots of illegal logging work until she was so broken that she was useless to her owners. They forced her into a breeding program where she broke her back and hips. It was an incredible yet sad privilege to see some of these elephants, to feed them, bathe them and even cut down their feed and shovel the resulting poop. But most of all, it was totally eye-opening. The elephant tourism industry in Thailand is booming, and with it comes cruelty that not many people are even aware of. Lek promotes awareness and I think this is one of the most fundamentally important parts of this organisation. Having a good ol’ scratch after their mud bath! I used to want to ride an elephant. It was one of those quintessential experiences that is on many people’s bucket lists. But, I said, I’d only do it if I found a reputable place that didn’t mistreat the elephants. What I didn’t realise, and I’m sure this is true for most of you, is that it’s not just how they’re treated now. It’s how they came to be part of the industry in the first place. 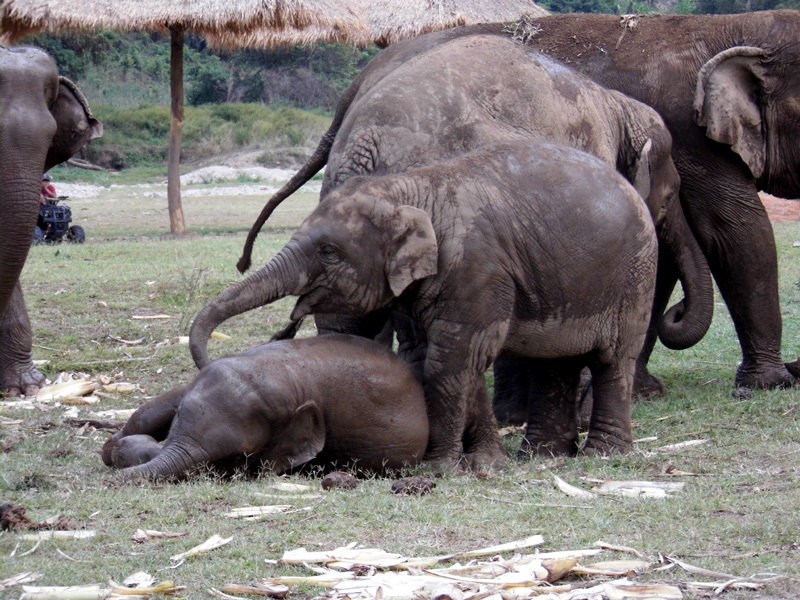 Babies are taken from their mothers; elephants are put into a cage that barely surrounds them (known as “the crush”) where they are beaten into submission until they listen to their trainers. This horrific torture can go on for days, usually three or four, and involves starvation and sleep deprivation techniques. Hooks and nails are used, and eventually the elephant loses its will and becomes, essentially, a slave. This lady (not Ash) is blind from the hooks used to train her. The girl next to her is her best friend and guide, and they are completely inseparable! Every elephant you see being ridden, every elephant in a show, every elephant who can be led through crowds of people; they have ALL been through this. And watching the video footage Lek has of this very thing happening had me in tears. And that’s why ENP is so important. Not only does it provide sanctuary for injured elephants (many of them blind from the hooks used in these processes, like the beautiful lady above), it shows people what they are (or could be) supporting, and also gives tourists a NEW way to enjoy elephants in as close to a natural environment as possible. It’s a win/win situation for the tourists AND the elephants. I spent intimate time with these amazing creatures over the course of my week there, and knew that I was doing so in a way that was helping them, not harming them. 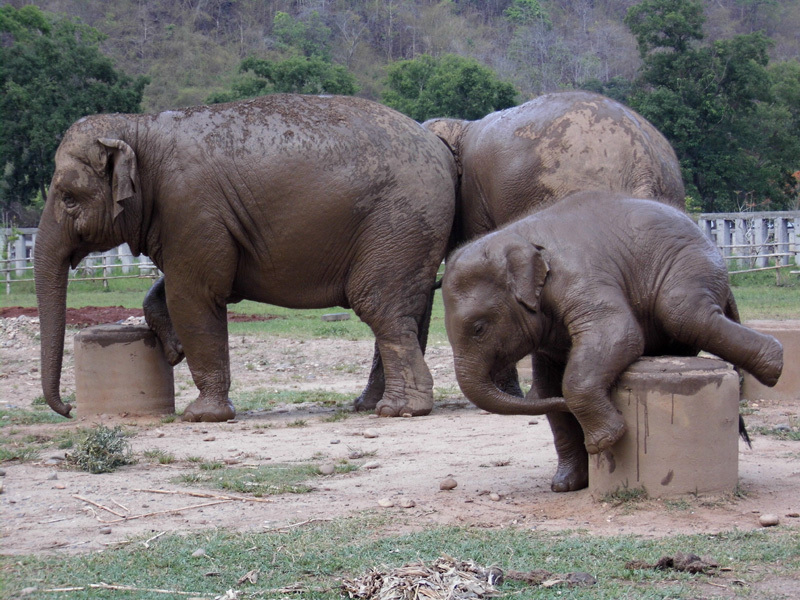 We bathed and fed them every day, we made banana mash balls and fed them to two elderly elephants, we watched two families interact and bathe in the river. And we worked hard to earn it. Every day each team would be given two jobs; one for the morning and one for the afternoon. It ranged from shovelling poop to raking the park to cutting down corn plants. Corn cutting was the hardest; we chose the hottest time of year to visit, and 4 hours of cutting plants with a machete in 40 degree heat is NOT easy. But for the most part it was fun, and where we had tough jobs, we would moan together – the corn cutting was one of the best team bonding sessions we had, and we got to ride on top of the corn truck on the way back which was a lot of fun! There were odd jobs too, like unloading watermelons from the truck and sorting the feed room. We also ADORED our 4 VCs (volunteer co-ordinators) who would lead each session. They were funny, helpful and super friendly, and loved kicking a ball around with Ash! It was Johnny’s birthday while we were there and he offered us all Thai whiskey and got very, very drunk, and we spent another evening watching football with them. We had buffet vegetarian food provided every day for breakfast, lunch and dinner, and throughout our lunch breaks there would be elephant feeding sessions from the platform. We had a Thai culture lecture evening which was one of the funniest things ever, we indulged in Thai massages one night for 150 baht (£3) from some local ladies, and we were given a welcome ceremony where we were blessed by a shaman before we watched kids from a local school dancing. Our room was great too; it included a basic bathroom but we had our own, which is more than a lot of people got! Our bed had a mosquito net, and one of the many dogs at the park made itself at home. In fact, not only does Lek help elephants, in 2011 she rescued many dogs from the floods of Bangkok and there are now over 400 dogs at the park. This side of the sanctuary is also looking for volunteers, and you can sign up for half the price of the elephant volunteering project, but still enjoy the elephant experience. And if you don’t have a week to spare, you can always visit for a day or an overnight trip where you still get to interact with the elephants on an ethical level. An absolute highlight from my week! I went out to take some pictures of the bathing session – to find no one had gone along, and I was alone with the elephants and mahouts!! This is one of my only “elfies” and I LOVE IT! So next time you think about riding an elephant, please, please consider visiting ENP or a similar park instead, or even sign up as a volunteer. It’s a totally remarkable place and I feel so honoured to have been a very small part of it. Elephant Nature Park’s office is based in Chiang Mai, and the park is an hour away. Volunteering is 12,000 baht per week (£240) and includes EVERYTHING: accommodation, 3 meals a day, and free tea/coffee. Work is generally 2 hours in the morning and 2 hours in the afternoon. You can also visit the park for the day or overnight, but I HIGHLY recommend one or even two weeks for the full experience. It’s the best thing I’ve ever done! This is one of the reasons we didn’t want to go to Phantasea in Phuket. Elephants are amazing animals! 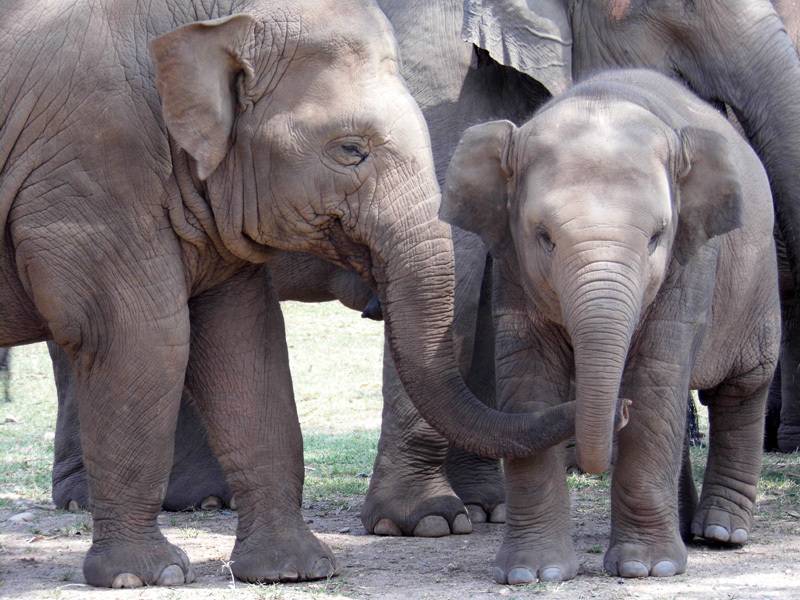 In Sri Lanka we also visited a park where elephants who were injured by mines found a home. Keep up the good travel! My day trip to ENP was one of the highlights of my whole life! I would love to spend a week volunteering but I have a lung disease and fear some of the work would be too much for me. Like that corn thing would never happen! How difficult was the other work? Aww I’m really glad you got the chance to visit! The corn cutting wasn’t too bad in itself, it really was just the heat was so intense, so physical outdoor work wasn’t the best. The other jobs are much easier, but to be honest you can put in however much you feel like you can, and you’re never made to feel like you should be doing more. In fact, I was one of the only people who almost always helped with unloading bananas and watermelons from the trucks (a very easy job! ), and other people were making up feeds, so I’m sure you could ask to do things like that in lieu of the more physical tasks. 🙂 There were people of all different ages and abilities there so I think they are very prepared for people not able to do everything and just happy with whatever you can do. I’ve heard many good things about elephant nature park but reading your post has hugely increased my desire to go. I’m even trying to work out if I can fit it into my holidays next year! Thanks for reading! 🙂 I really hope you get to go, it’s 100% worth it! Ah this makes me so excited for my second trip back there in a couple weeks. I am obsessed with elephants and I learned so much my first visit. I wish I had the time to volunteer and stay longer than a day but excited to get the chance to even go for a day. Thanks for sharing your experience!! Ahhh I would LOVE to go back too! 🙂 So glad you loved it there! 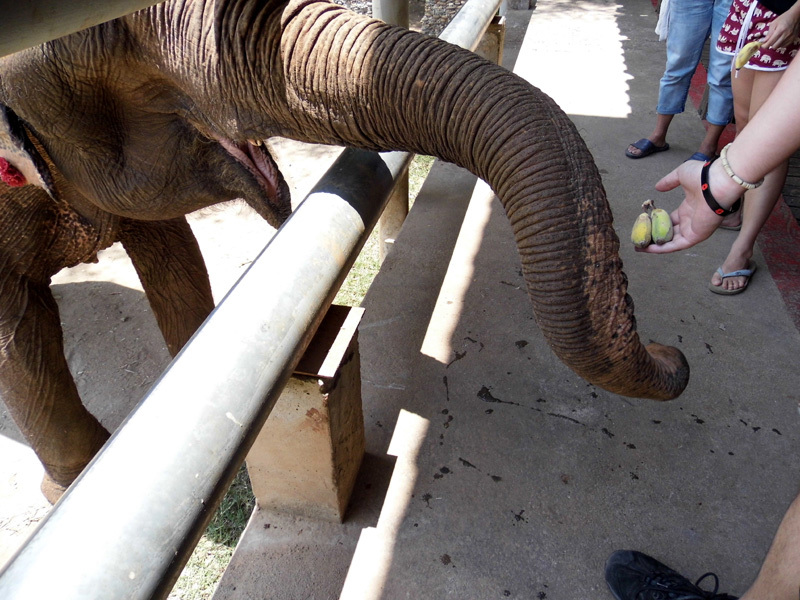 I am also looking for options to volunteer and I’m glad you were fortunate to be a part of elephant nature park. Volunteering makes one internally happy and I can see same smile on your face. Thoroughly enjoyed reading your experience. Thank you so much! 🙂 I think voluntourism can be a difficult subject to tackle, but ENP is definitely a safe choice! What kind of volunteering would you like to do? Must surely have been a memorable experience hanging out with the elephants. Not much else can beat that! What a fabulous experience to have! Songkran is great fun, but it is unbearably hot. Well done for cutting the corn it that heat, especially as you are not used it it. I am sure that it was both rewarding and exhausting. I am so glad to have read this! I’d seen before how some places are so unethical etc. but never heard the details and what you can do instead! What a unique experience. And I love your “elfie”!!! Yeah, it’s hard to know what’s good and what’s bad sometimes. I used to want to ride an elephant with a firm belief that some places would be more ethical than others. I never knew the secrets behind training them to get to that point! 😦 And thank you!! It’s heartbreaking to learn that the elephants are mistreated just to ‘train’ them. Tourism, at times, can be bad when done irresponsibly. I’m glad to know that there are organizations like this that cares and protects animals. I had no idea the elephants were mistreated. It’s not something that makes it into the US media, so tourists from the US, even the ones who would never willingly support such cruelty, would have no idea that this was going on and what they would be contributing to by choosing to ride an elephant at one of the many tourist attractions. Lately, I have read alot on ENP and feel emotially attached to the cause as in India we treat elephant as a sacred animal. Would love to visit this place someday. Thanks for this beautiful account of your volunteering at ENP. Thank you! 🙂 I find that part of Indian culture fascinating actually, because elephants are ridden there and presumably they must go through the same thing. Yet they are sacred. Perhaps it is less common for them to be used in the tourist industry though, which is why it’s such a big problem in countries like Thailand? Ahh yes I love elephants. This is totally something I would like to do. I was really happy to hear about this place but then I started to think why would something like this be needed and sure enough as I continued to read the post I understood. I sad to hear how they are mistreated just so we can be entertained. I learned something today and my dream to ride an elephant has to be with elephant that weren’t abused so I can for fill my dream. That smile on your face says it all! 🙂 It is so heartwarming to read about this volunteering project. Must say you have been fortunate to be a part of it. We would love to do this sometime soon as we love animals.